A second immigration removal centre planned for Gatwick would have the capacity to hold 426 asylum seekers. A planning application has been submitted to Crawley Borough Council for a three-storey building to be built around 200m (220yds) from the runway. 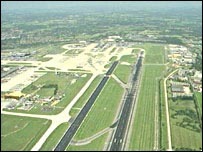 The unit would cover almost 13,000 sq m (3.2 acres) within the airport grounds. In the application the Home Office said more provision was needed near to major airports to assist with unauthorised immigration activity in the UK. An existing centre at Gatwick has 146 places. The new unit would be surrounded by a 5.2m (17ft) security fence. A visitor centre and a gatehouse were also planned. More than 400 people are expected to be employed at the centre which is expected to be built in 2008.